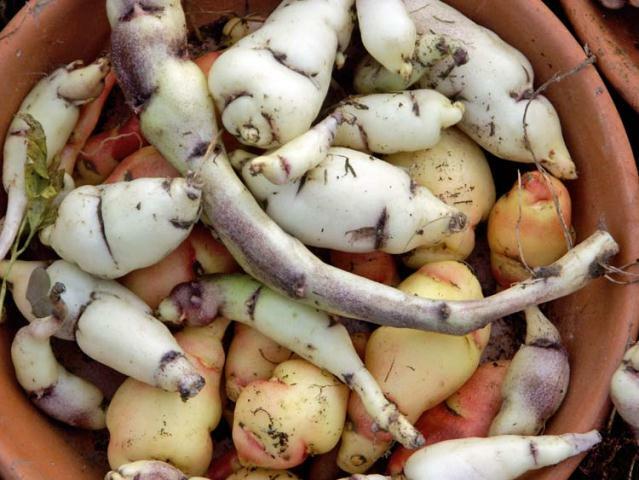 Ahipa: A promising new root crop for drought-prone regions of Central and West Africa. Researchers from the International Potato Center (CIP) are working in Benin for a project designed to introduce ahipa, a highly nutritious root crop originating in the Andes of South America, as a promising food staple in drought-prone regions of Central and Western Africa. They are discovering that beyond its potential as a healthy food alternative for people, it may become valuable as livestock feed that not only improves farmers’ diets, but also their bottom line. Giant African snails, considered a delicacy and sold in gourmet restaurants, crawl around a cement enclosure in Benin. It is the size of a large dining room table. Animal production scientist, Charles Pomalegni, pulls up two of the snails to show to researchers from the International Potato Center. They are as big as his fists. In parts of Africa and Asia, giant snails are raised by small-scale producers in plots behind their home or work compounds. Today, they are thriving on an unusual source of feed, a root crop called ahipa, which originates in the high Andes of South America. The CIP researchers are in Benin for a project designed to introduce the highly nutritious ahipa as a promising food staple in drought-prone regions of Central and Western Africa. They are discovering that beyond its potential as a healthy food alternative for people, it may become valuable as livestock feed that not only improves farmers’ diets, but also their bottom line. Ahipa is the legume root produced by the American yam bean (Pachyrhizus spp.). Shaped like a very large radish, there are two types. The low dry matter one has a crunchy, juicy texture and is usually eaten raw. It is a good source of protein, supplies potassium and vitamins C and K, and has a high water content that makes it easy to digest. There is another high dry matter type, which is more suitable for cooking and processing. “Ahipa is an excellent complement or alternative to other common staples. It offers more nutrients than cassava, and it pairs well with vitamin A-rich orange-fleshed varieties of sweet potato,” says Wolfgang Gruneberg, a CIP breeder and geneticist who leads the ahipa program. Ahipa will grow in dry, marginal conditions. And because the plant fixes nitrogen in the soil, it does not require nitrogen fertilizer. The result is a crop that is inexpensive to produce and well suited to the needs of small farmers as an integral part of a sustainable land-use system. “But ahipa’s potential as livestock feed or for local processing may bring even greater value added to small-scale farmers,” notes Graham Thiele, an economist and Director of the CGIAR Research Program on Roots, Tubers, and Bananas. Along with the giant snails, project participants are undertaking feeding trials with nursery fish and a highly-prized rodent called a grasscutter. The grasscutter has meat that is rich in protein, low in fat, and appreciated for its taste and tenderness. CIP is collaborating with agricultural research institutes in Uganda, Burundi, Rwanda, Benin, DR Congo, and the Université Catholique de Louvain in Belgium. They are combining research from Africa, Europe, and Latin America to increase the availability of yam bean collections and breeding lines, identify high-yielding varieties adapted to agro-forestry-based or maize-mixed farming systems, and develop its commercial potential. Impact assessment studies have been integrated, as well, to identify where resources can be used most effectively to maximize benefits and adoption. What really excites Gruneberg, however, is the prospect of introducing a highly beneficial crop into a new region. “If we see local farmers in Africa adopting ahipa, adapting it to different uses, and benefitting from it, that will be an impressive success, indeed!” he concludes.